Italian test pilot mission specialist astronaut 1992-1996. Was married to astronaut Marianne Merchez. Status: Inactive; Active 1992-1996. Born: 1959-05-04. Spaceflights: 1 . Total time in space: 15.74 days. Birth Place: Modena. Born May 4, 1959, in Modena, Italy. Married to the former Marianne Merchez. Her parents, Marcel and Annie Merchez, reside in Brussels, Belgium. He enjoys soccer, cycling, tennis and traveling. His parents, Araldo and Eulalia Cheli, reside in Zocca (Modena), Italy. Graduated from Liceo Classico "M. Minghetti" in Bologna in 1978, from the Italian Air Force Academy in 1982, from the Italian Air Force War College in 1987 and from the Empire Test Pilot School in 1988. He studied geophysics at the University of Rome in 1989 received a Master of Science in Aerospace Engineering from the University of Houston. Distinguished graduate, Fighter lead-in training (1983). Top graduate, Italian Air Force War College (1987). Top graduate, Empire Test Pilot's School (1988). Italian Air Force Long Service Medal (1988). McKenna Trophy, Sir Alan Cobham Trophy and Hawker Hunter Trophy, Empire Test Pilot's School (1988). After graduation from the Italian Air Force Academy, Cheli underwent pilot training at Vance Air Force Base, Oklahoma, in 1982-1983. Following fighter lead-in training at Holloman Air Force Base, New Mexico and initial training in the F-104G in Italy, he joined the 28th Squadron, 3rd Recce Wing in 1984. In 1987, he attended the Italian Air Force War College and in 1988 he graduated from the Empire Test Pilot's School, Boscombe Down, United Kingdom. While assigned to the Italian Air Force Flight Test Center in Pratica di Mare, Rome, he served as a Tornado and B-707 Tanker project pilot on a variety of test programs and as display pilot. His flight experience includes more than 3000 flying hours in over 50 different types of fixed wing aircraft and helicopters. In June 1992, he was selected by the European Space Agency as a member of the second group of European astronauts. Cheli holds a commission as a Lieutenant Colonel in the Italian Air Force. Cheli reported to the Johnson Space Center in August 1992 and completed one year of training in August 1993. He is qualified for assignment as a mission specialist on future Space Shuttle flight crews. His technical assignments to date include: flight software verification in the Shuttle Avionics Integration Laboratory (SAIL); remote manipulator system/robotics; crew equipment. He flew on STS-75 in 1996 and has logged over 377 hours in space. Most recently, Cheli was a mission specialist on the crew of STS-75. The principal payloads on STS-75 were the reflight of Tethered Satellite System (TSS) and the third flight of the United States Microgravity Payload (USMP-3). The TSS successfully demonstrated the ability of tethers to produce electricity. The TSS experiment produced a wealth of new information on the electrodynamics of tethers and plasma physics before the tether broke at 19.7 km, just shy of the 20.7 km goal. The crew also worked around the clock performing combustion experiments and research related to USMP-3 microgravity investigations used to improve production of medicines, metal alloys, and semiconductors. STS-75 launched February 22, 1996 and landed back at the Kennedy Space Center on March 9, 1996. The mission was completed in 252 orbits covering 6.5 million miles in 377 hours and 40 minutes. Family: Astronaut. Country: Italy. Flights: STS-75. Projects: STS. Agency: Italian AF. Bibliography: 12, 5255. 1959 May 4 - . Birth of Maurizio Cheli - . Nation: Italy. Related Persons: Cheli. 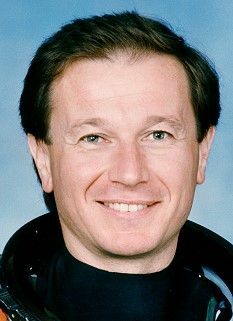 Italian test pilot mission specialist astronaut 1992-1996. Was married to astronaut Marianne Merchez. 1 spaceflight, 15.7 days in space. Flew to orbit on STS-75 (1996)..